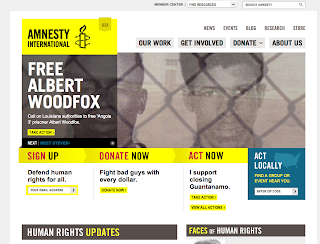 Please sign the Amnesty International petition to release Albert Woodfox here! Amnesty International has launched a new campaign demanding Albert Woodfox’s immediate release from prison (featured below), declaring that “Herman died a free man. 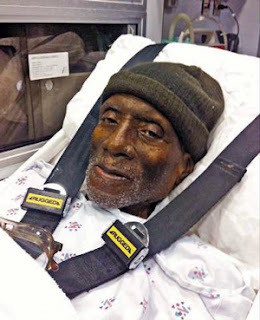 Let’s help Albert live as one.” Indeed, it is now its up to us to continue Herman Wallace’s fight for justice. We must do everything we can to have Albert released from prison as soon as possible. 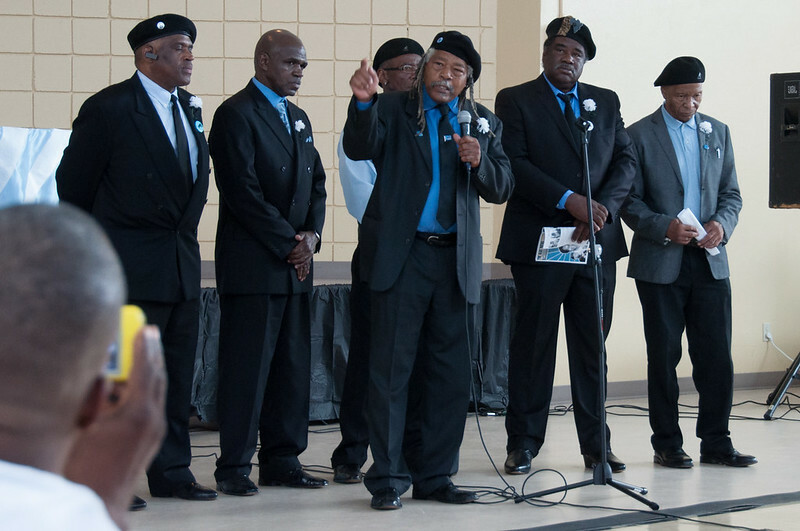 The widespread media coverage documenting Herman’s struggle for release during his final months has exposed the horror of ‘Louisiana Justice’ for anyone who is willing to look. 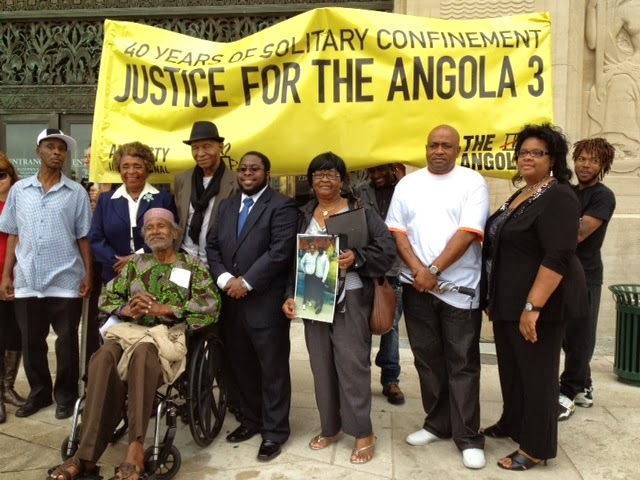 Consequently, the world is disgusted by the inhumanity and repression endured by the Angola 3. Last week, the United Nations Special Rapporteur on torture, Juan E. Méndez, called for Albert’s immediate release from solitary confinement. 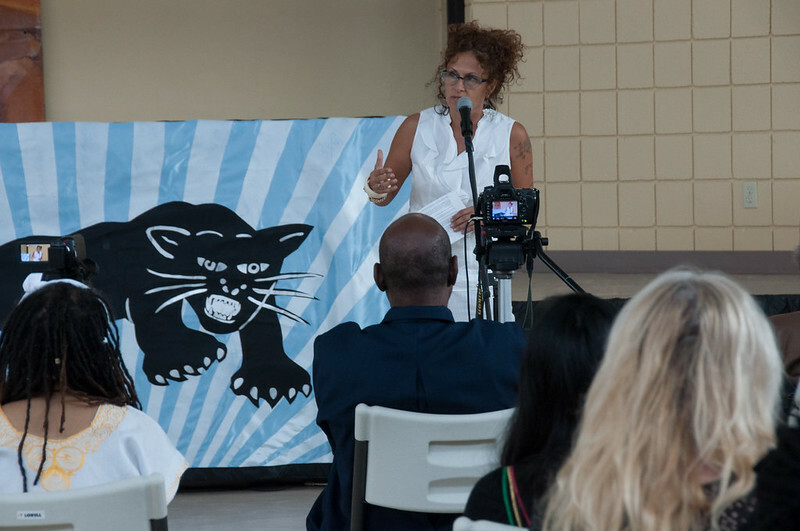 “Keeping Albert Woodfox in solitary confinement for more than four decades clearly amounts to torture and it should be lifted immediately,” said Mr. Méndez. “I am deeply concerned about his physical and mental condition.” Read the full UN statement here. 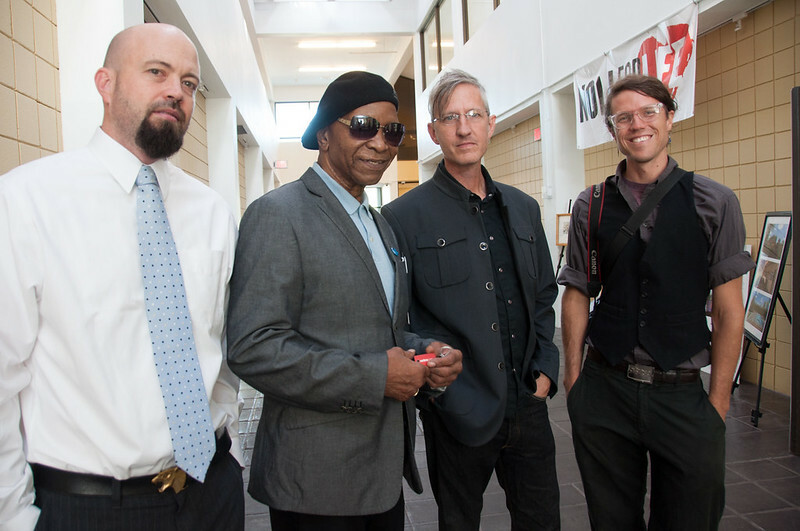 We are inspired by Herman’s release, yet outraged that it took so long. Today, we firmly believe that the momentum created by Herman’s struggle, the recent UN statement for Albert, and now the Amnesty campaign, is the final push we need to make Albert’s freedom a reality. 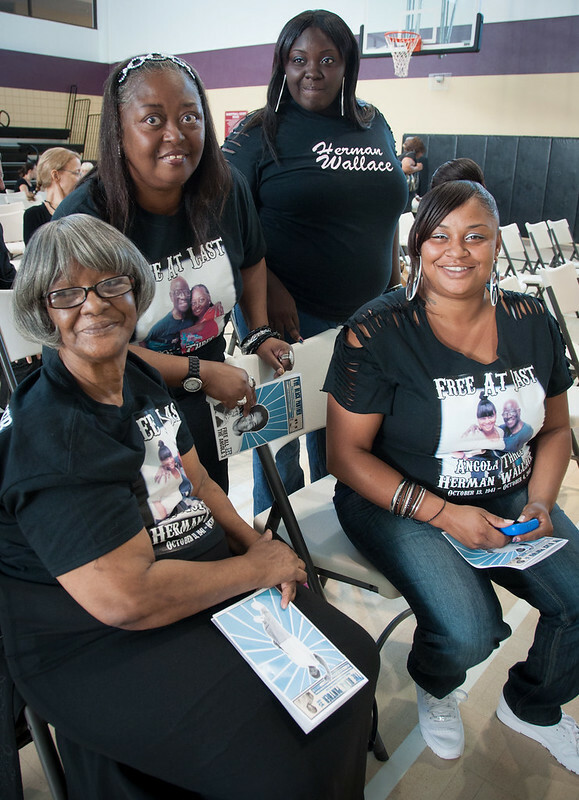 This is our best chance ever for Albert’s release and the time for action is now. 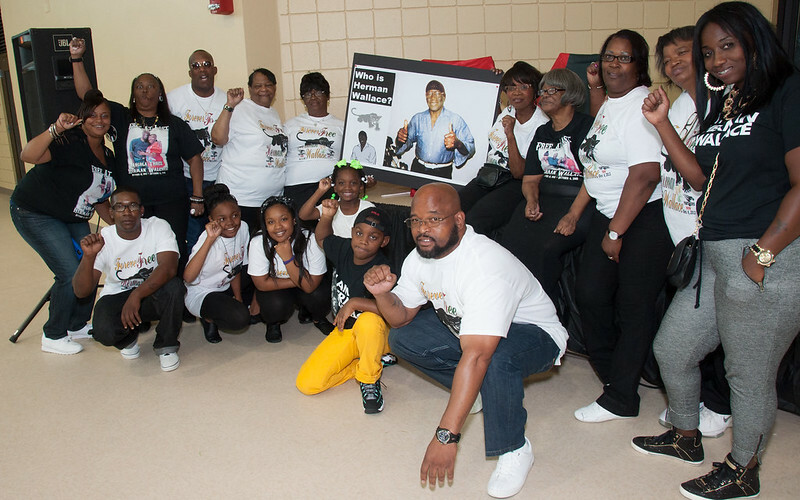 Please join us in Louisiana for events on Saturday, October 19 and Monday, October 21. More information about the events and campaign to free Albert are featured below. 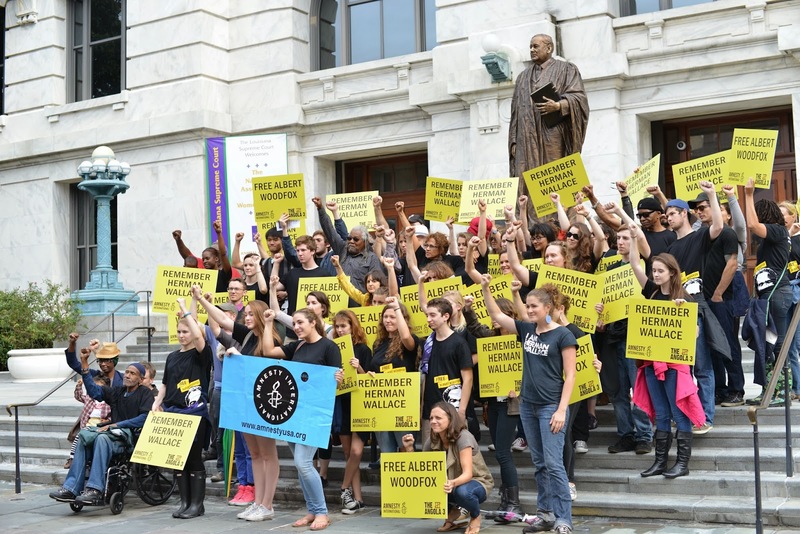 Amnesty International’s campaign is calling on James Caldwell, Attorney General of Louisiana, Bobby Jindal, Governor of Louisiana, James M. LeBlanc, Secretary of the Department of Public Safety, and Jocelyn Samuels, Acting Assistant Attorney General, to release Albert from prison. 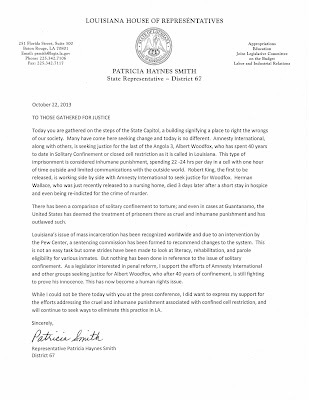 The email action and a separate press release are both reprinted below, in full. 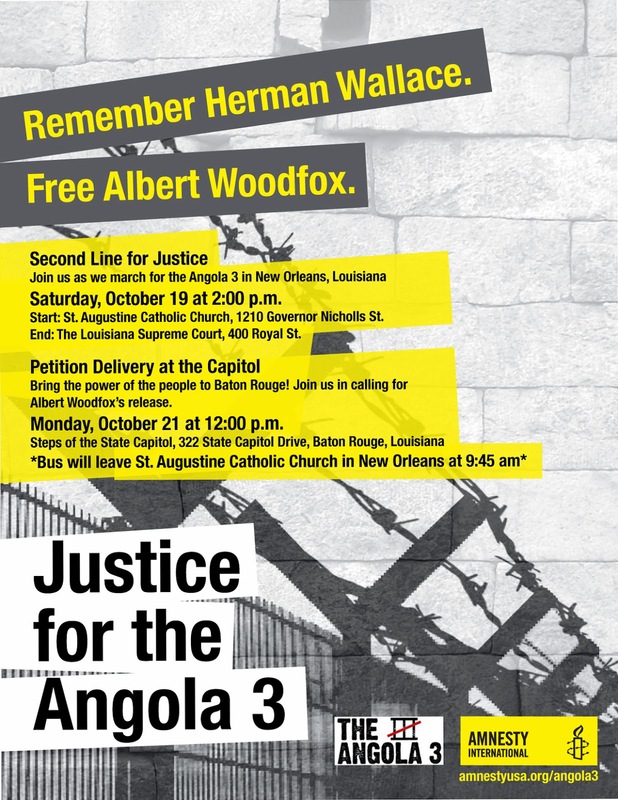 As part of their campaign, Amnesty International is organizing two upcoming events in Louisiana with Angola 3 supporters. On Saturday, Oct. 19, there will be a second line parade in honor of Herman in New Orleans, at 2:00 pm, starting at St. Augustine Catholic Church, 1210 Governor Nicholls Street, and concluding at the Louisiana Supreme Court, 400 Royal Street. Bring your banners, wear your t-shirts and join the parade for Herman! 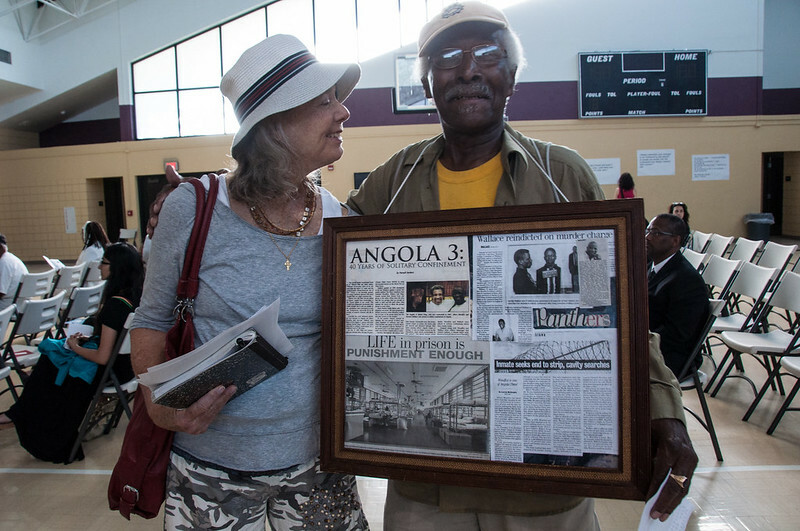 On Monday, Oct. 21, there will be a media conference at the State Capitol in Baton Rouge with congressional champions and Angola 3 advocates who will hand deliver tens of thousands of signatures calling for Albert’s release. 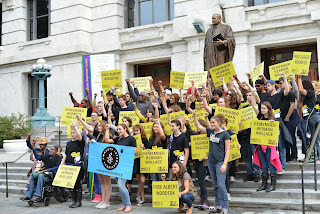 Amnesty and supporters will gather at 12:00 noon on the steps of the Capitol, 322 State Capitol Drive. For transportation from New Orleans, a bus will leave from St. Augustine Catholic Church, 1210 Governor Nicholls St. at 9:45 am. Join us for this important event. 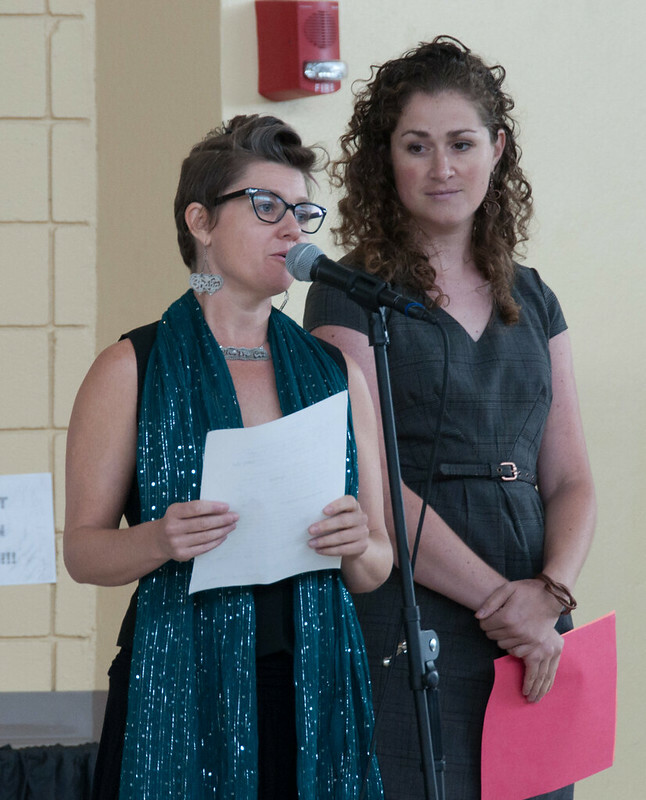 Later, on the evening of the 21st, at 8:00 pm, A3 supporter Jackie Sumell, of Herman’s House, will be speaking at Tulane University (Kendall Cram, LBC). See the event flyer here. 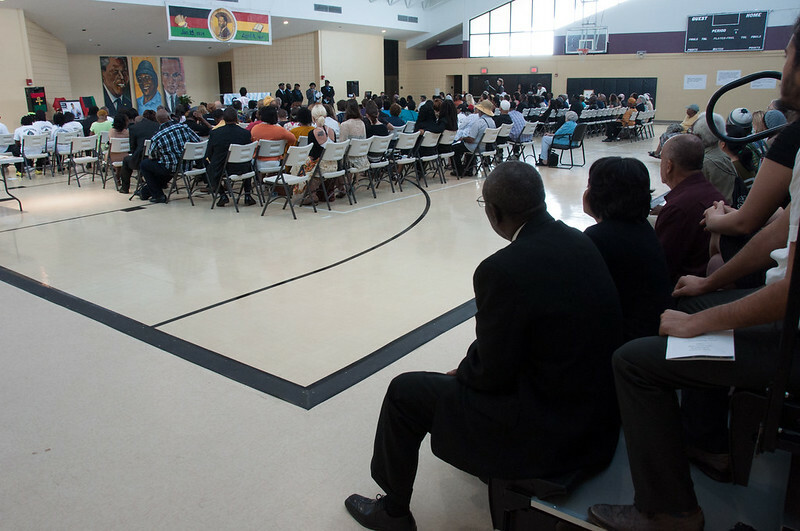 As a proud black man who struggled for justice for himself, his comrades, his people and all people, Herman wanted the remembrance to be in a community space and to provide a forum for many of his supporters to speak and most importantly to bring people together. As you’ll see from the photos below, it was a memorable occasion. 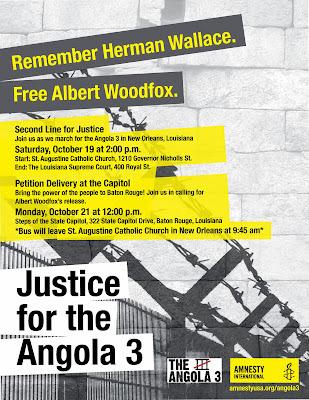 You can also read the statement that Albert Woodfox wrote for Herman, featured below. 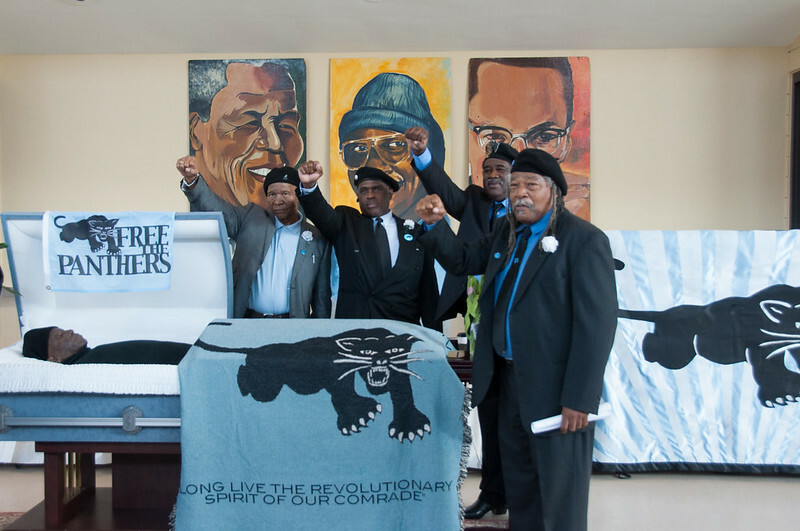 Rest in peace and in power Herman Wallace – the struggle continues. –Mariame Kaba is the director of Project NIA. Old man, was my term of endearment – it had to do with the age of everything – to do with his heart and soul. Herman “Hooks” Wallace was not a perfect human being, and like all men, he had faults and weaknesses, but he also had character! He could make me so mad, that I wanted to rip his head off! Then he would melt my heart with a word, or act of kindness to another human being. 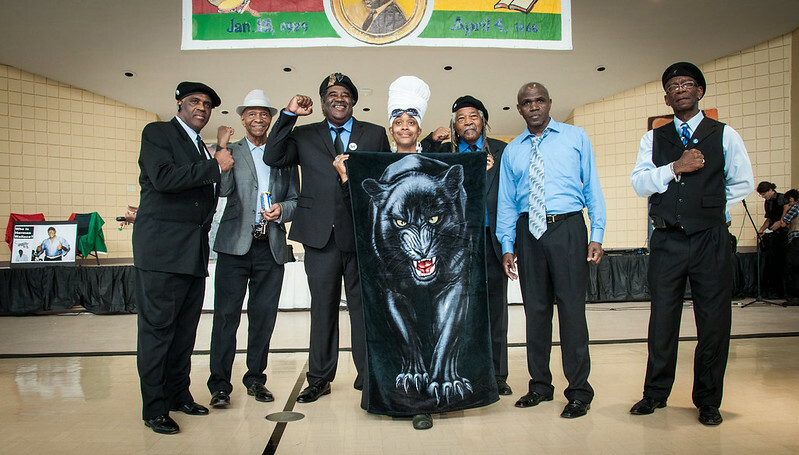 I had a chance to say goodbye to my comrade in the struggle, my mentor in life, my fellow panther and most of all, my friend. 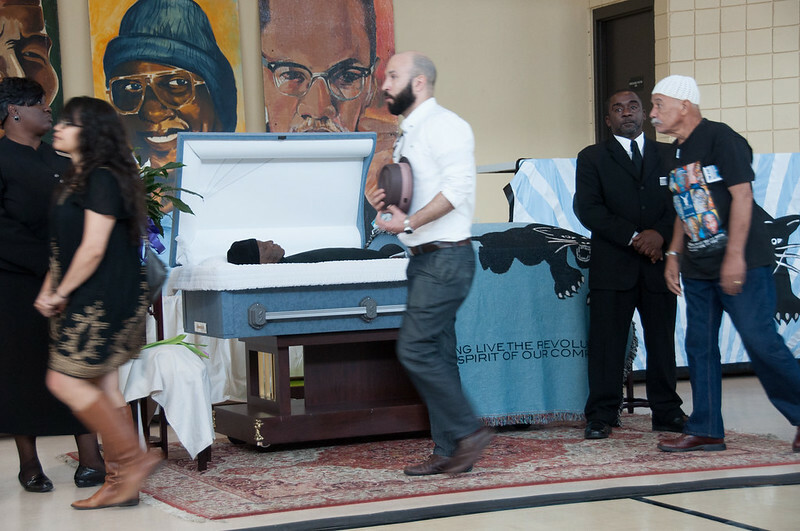 Herman taught me that a man can stumble, even fall, as long as he gets up. That it’s OK to be afraid, but hold onto your courage. To lose battle, is not the loss of a war! 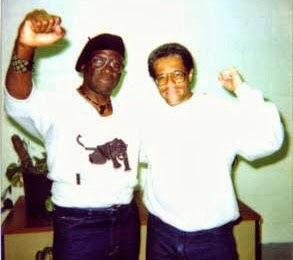 Herman Wallace’s greatest pride was joining the Black Panther Party for self defense! He believed in duty, honor and dedication. He never broke the faith of the party, his comrades or the people. As I bent to kiss his forehead, my heart said goodbye – I love you forever – my soul said – separated but never apart – never touching, but always connected. He was the best of us, as long as we remember him, he lives on. 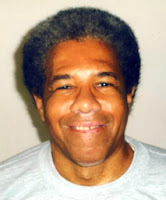 Reprinted below is a new statement released today by the Office of the United Nations High Commissioner for Human Rights, demanding Albert Woodfox’s immediate released from solitary confinement. GENEVA (7 October 2013) – The United Nations Special Rapporteur on torture, Juan E. Méndez, today called on the United States to immediately end the indefinite solitary confinement imposed on Albert Woodfox since 1972. 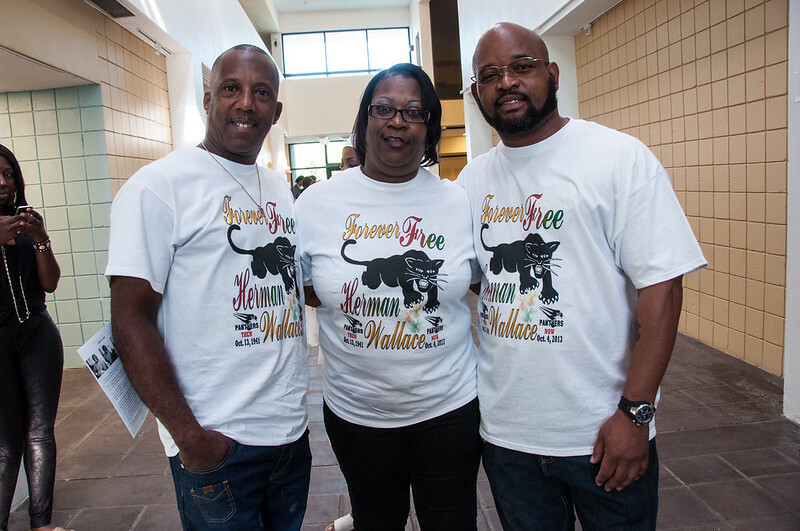 Mr. Woodfox was convicted of murder together with Herman Wallace, who was released last week when his conviction was overturned on appeal. 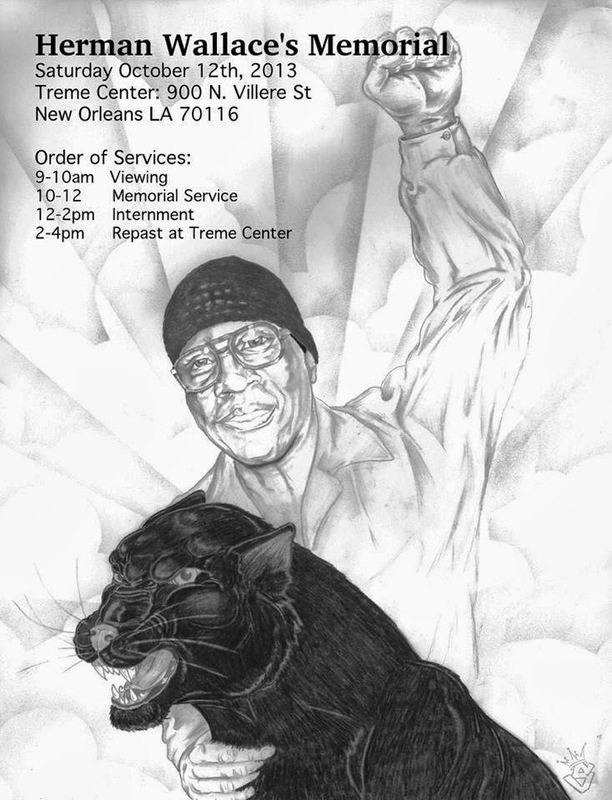 A day later, on 2 October, Mr. Wallace died after battling cancer, having spent 41 years in solitary confinement. “The circumstances of the incarceration of the so-called Angola Three clearly show that the use of solitary confinement in the US penitentiary system goes far beyond what is acceptable under international human rights law,” the independent investigator on torture and other cruel, inhuman or degrading treatment or punishment noted. 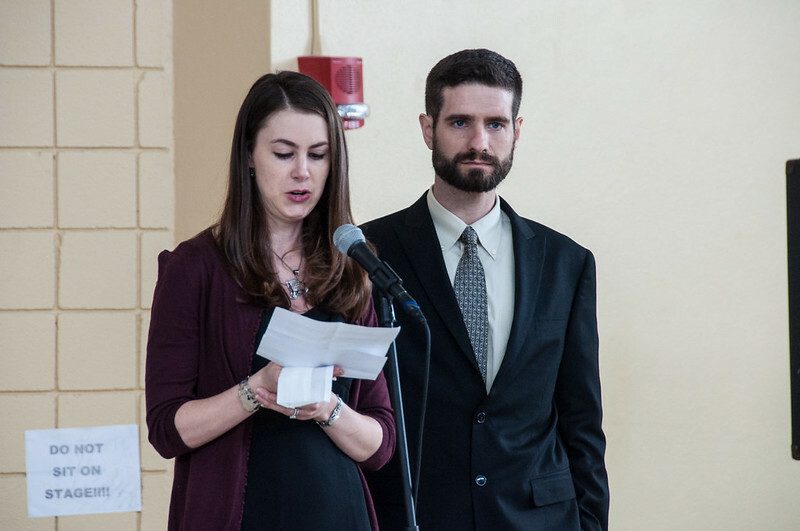 “Persons held in solitary confinement should always be allowed to challenge the reasons and the length of the regime, and should always have access to legal counsel and medical assistance,” Mr. Méndez said. The human rights expert urged the US Government to adopt concrete measures to eliminate the use of prolonged or indefinite solitary confinement under all circumstances. 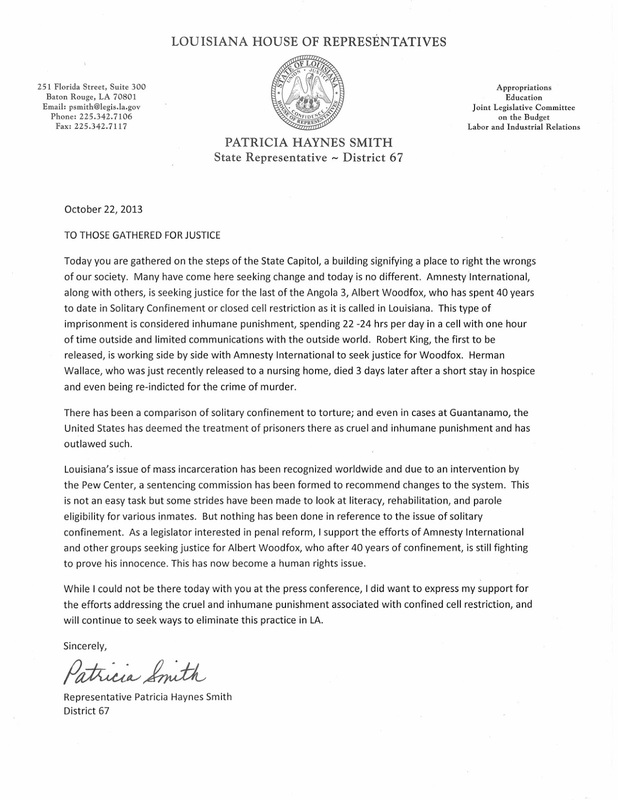 The Special Rapporteur addressed the issue of solitary confinement in the US in his 2011 report* to the UN General Assembly and in numerous communications to the Government. 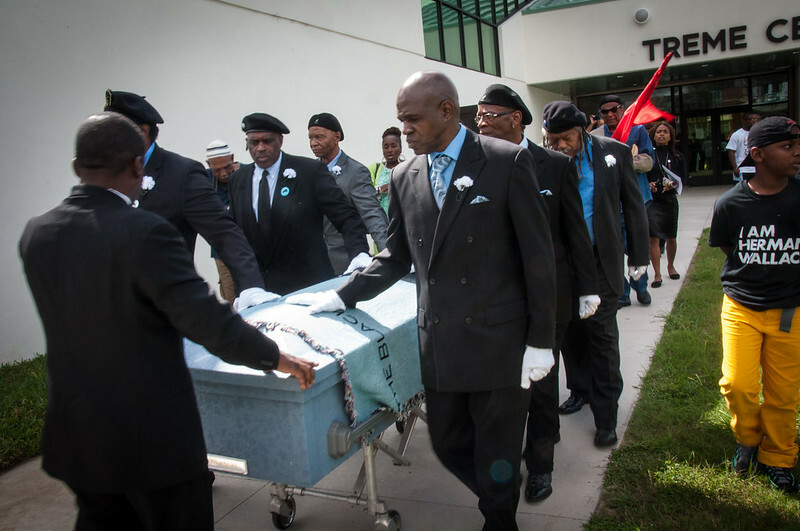 He has also repeatedly requested an invitation to carry out a visit to the country, including state prisons in California, but so far has not received a positive answer. 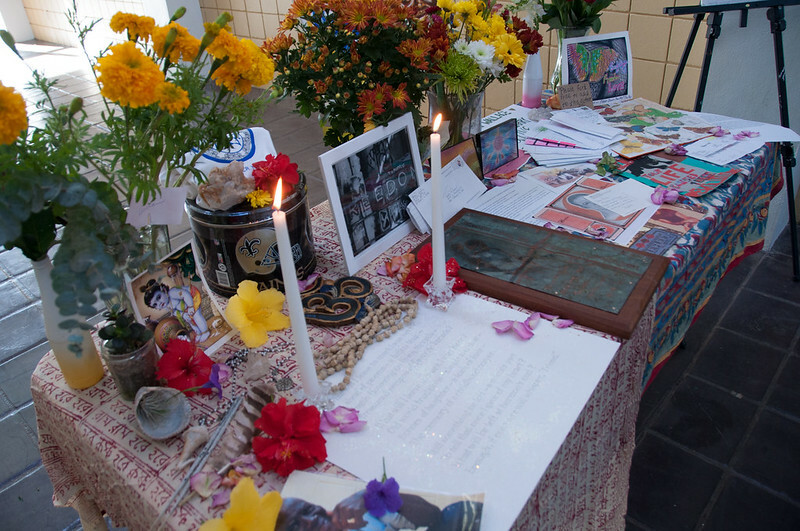 For more information and media requests, please contact Ms. Sonia Cronin (+41 22 917 91 60 / scronin@ohchr.org).